Posited: You can make a vampire movie which is unique, which bends vampire conventions, and which takes some liberties with the traditional vampire mythos without it turning into a frou-frou girlypants mess. I'm looking at you, Cullen. But also you, Lestat. Since I kicked off last year's Project Horror with Dracula, I decided that I would begin Return of Project Horror with a whole block of vampire movies. Not just any vampire movies, though - I wanted vampires that would mess with the established formula a little bit. Vampire Variations! I knew just which one to start with, too. 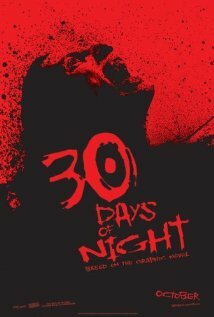 I'm embarking on another month of horror movies, so I thought that I'd watch a movie about a group of people who are also trying to survive for a month, 30 Days of Night. Like so many great horror movies, the premise of this one is simple, but can be taken to interesting places. A group of vampires invades Barrow, Alaska to take advantage of that city's monthlong polar night. Although many of the town's residents leave for the month, there are enough people who stay behind that the vampires have a veritable buffet laid out before them, and a month to ferret out any stubborn survivors. I'd heard that the comic that this movie was adapted from was very good, and I'd still like to check it out sometime. If the movie is a faithful adaptation, I think I can say that this probably was a good comic, but suffered some in the translation to the big screen. Although I did like this movie overall, and love the idea of vampires taking advantage of a loophole in that pesky sunlight limitation, the execution was kind of lacking. After the initial setup and attack, the rest of the movie was pretty much a repeated sequence of the survivors hiding someplace, the vampires doing something to lure or force them out, and the survivors deciding they need to move to a new location. Along the way to the new location, their numbers gradually get smaller and smaller. Again, an interesting setup, but I started to lose interest by the second or third iteration of "We have to go someplace else!" Still, this was a fun movie, and worth checking out if you like the vamps. The lead vampire is especially good, and the decision to dress all of the vampires in very stark but elegant black and white really works, as does the decision to have them speak their own language. I read that it's a language that was invented specifically for the movie, and it really works, because it sounds like some long lost ancient tongue. There's a scene (unfortunately spoiled in the trailer) where a victim calls out to God, and the lead vampire taunts her for it; it's probably the movie's best-played moment. Also good? Josh Hartnett blasting a lady vamp with a sun lamp that his grandma uses to grow pot indoors. I am not making that up. Remember when Josh Harnett was almost a Big Thing? For a while there, it seemed like he was everywhere, getting nominated for MTV and Teen Choice awards left and right. Have you heard much about him lately? The guy is still working, and his resume is filled with directors that other young actors would kill to work with (Robert Rodriguez, Sofia Coppola, Ridley Scott, Michael Bay), but he just hasn't seemed to live up to his early promise. Anyway, check this one out. Don't move it to the top of your Netflix queue or anything, but if you see it in your TV listings, it's worth a shot. I give it three vampire bats out of five. Several years ago, before this movie, there was a Twilight Zone episode about vampires taking over a Soviet prison village in Siberia. Well done and similar in theme to this. Was this one you've seen before or no? Doug forced me to watch it, and I LOVEDit! Never saw it before. It's definitely a departure from the usual vampire fare, which I liked. I'd forgotten that one until you mentioned it. Was that on the newer TZ, or one of the original series?